Pictured at the left are the results of one of my latest group projects. 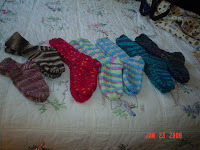 Last winter I told a lady that I would knit socks for her and her six children. I am now finished with that task and today I delivered them to her. It was a good feeling.